Geopolitical tensions on the Korean Peninsula have sharply increased in 2017 due to North Korea´s nuclear and missile tests. Tensions between North and South Korea have abated somewhat in early 2017, but remain high between Washington and Pyongyang. 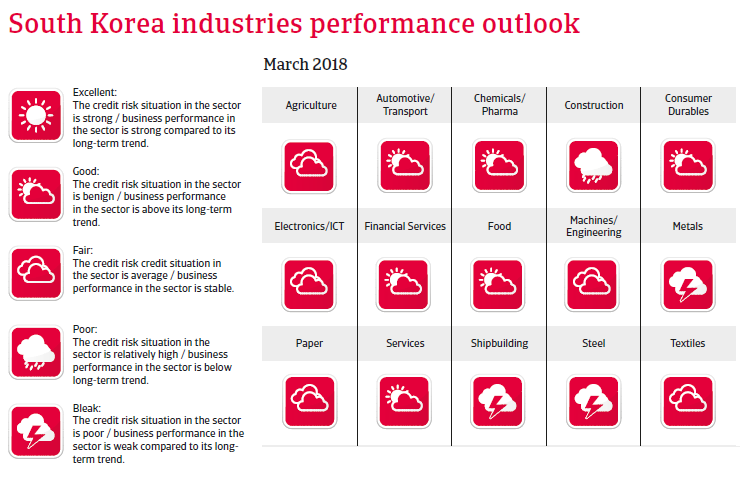 Any increase in tension or even escalation of the conflict would have adverse effects on business and household confidence in South Korea and on foreign investors. 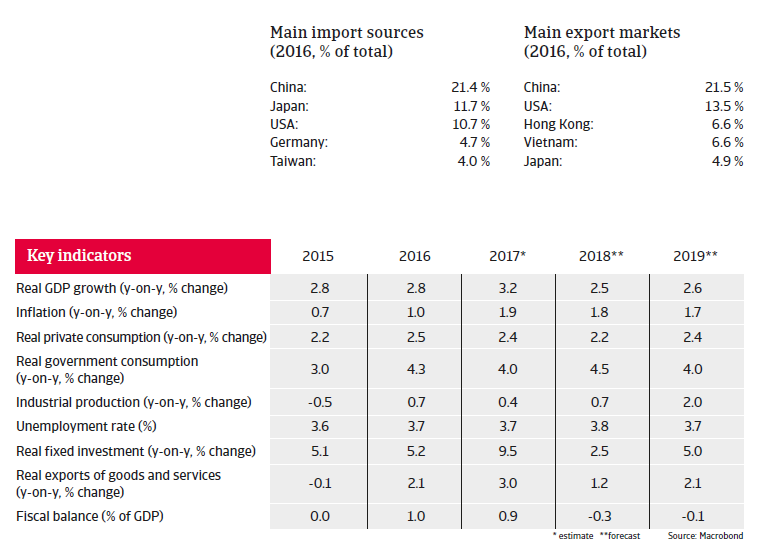 In 2017 the recovery in global trade and higher-than-expected import demand from China has driven South Korea´s GDP growth to more than 3%, with the semiconductor industry leading the export rebound (exports account for about 50% of the country’s GDP). 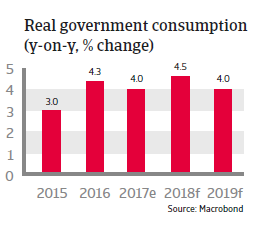 Investments recorded a robust increase, while household consumption growth remained muted due to debt repayments by households: with debt levels at about 160% of disposable income, Korean households are, on average, highly indebted. 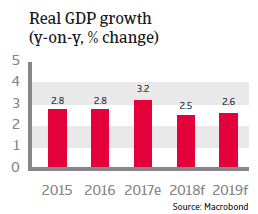 In 2018 GDP growth is expected to slow down somewhat due to decreasing demand from China. Fiscal support (an increase in public employment and social spending and a minimum wage increase) is expected to sustain economic expansion. The low public debt level (43% of GDP in 2017), low external debt (24% of GDP in 2017) and consistent current account surpluses provide the South Korean government with flexibility in supporting the economy and offer some protection against international investment volatility. 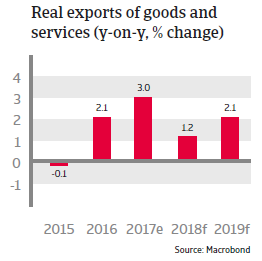 It seems that South Korea’s current economic model - export driven and dominated by chaebols (the South Korean form of business conglomerate) - is no longer capable of providing sufficient employment and purchasing power growth. The outcome of government efforts to reform the conglomerates still remains to be seen. More reforms are needed to diversify the economy, away from overly export-oriented towards growth driven by services and domestic consumption. Necessary measures would be an improvement of the business environment through deregulation, increasing labour market flexibility and lowering entry barriers to the still unproductive service sector. The high level of private debt remains a downside risk for the economy, together with a rapidly ageing population and tougher competition from China in a range of industries (automotive, electronics, and shipbuilding). International competitiveness and businesses’ profitability could suffer from the minimum wage increase. Concerns remain over US trade policy: after the Trump administration threatened to withdraw from the bilateral free trade agreement, Seoul had to agree on renegotiations. Early 2018 the US imposed punitive import tariffs on washing machines and solar panels, targeting South Korea among other states. Payment behaviour in the South Korean ICT sector has been good over the past two years, and the number of payment delays and insolvencies is low.